Summary: Learn how to repair damage to plasterboard, fix fine cracks in plasterboard, repair a small hole in plasterboard and repair a large hole in plasterboard. Fine cracks in plasterboard walls and ceilings can be filled with filler and sanded. 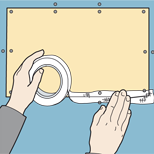 The joints between the boards of a plasterboard wall or ceiling are covered by scrim tape. Over time the tape can lose its adhesion and come loose. 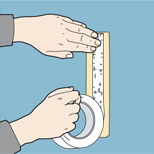 This is easily repaired by cutting off the loose piece of tape and replacing it with a new piece of scrim tape or self-adhesive jointing tape, which can then be re-sealed with jointing compound. Replace loose pieces of scrim tape and re-seal with jointing compound. 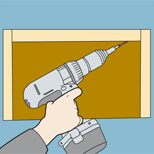 Small holes in plasterboard can be repaired using an off-cut of plasterboard. 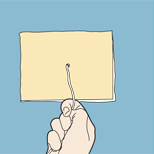 Cut around the hole or crack in the plasterboard to make a rectangular hole. Cut a rectangle of plasterboard slightly larger than the hole and make a small hole in its centre. Thread a piece of string through the hole and tie a nail to the string to prevent it from slipping back through the hole. Apply some PVA adhesive around the edges of the plasterboard off-cut. Push the plasterboard rectangle through the hole with the adhesive facing you. 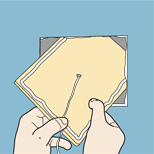 Pull the string tight ensuring the off-cut completely covers the rectangular hole and hold the plasterboard in place as the adhesive sets. 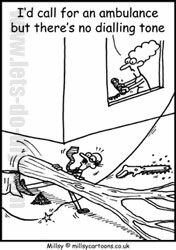 The plasterboard off-cut can be kept in place by tying an off-cut of timber that spans the hole to the string. When the adhesive has dried cut the string close the surface of the plasterboard. Filler can now be applied to the repaired area, although more than one layer may be needed to achieve the right level. Sand the area to a level finish and redecorate. Cut around the hole or crack to make a rectangular hole. Pull the string tight ensuring that the rectangle covers the hole and hold in place until the adhesive has set. 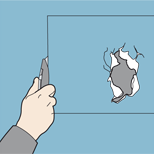 To repair a large hole you will need to cut out a section of plasterboard between two wall studs. Use a stud detector to locate the studs on either side of the damaged area and mark them on the wall, using a spirit level to achieve a vertical line. Again with the spirit level, draw horizontal lines between the vertical lines to make a rectangle that contains the damaged area. Cut out this section of plasterboard using a craft knife to expose the wall studs. To provide fixing points for the screws fix two timber noggings to the studs at the top and the bottom of the cut out rectangle. 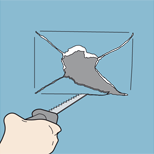 The noggings should extend behind the cut out rectangle to allow you to screw the original plasterboard to the noggings as well. Take the dimensions of the rectangular hole and cut out a panel of plasterboard to fit. Position the cut piece of plasterboard into the hole and secure it to the studs and noggings using drywall screws. Also fix the edges of the original plasterboard to the studs and noggings with screws. Cover the joints with self-adhesive jointing tape. Mix a small amount of finishing plaster and apply over the repaired area with a plastering trowel. When the plaster is dry, sand smooth. Cut out your marked section of plasterboard with a craft knife. Fix two timber noggins to the exposed studs at the top and bottom of the hole.